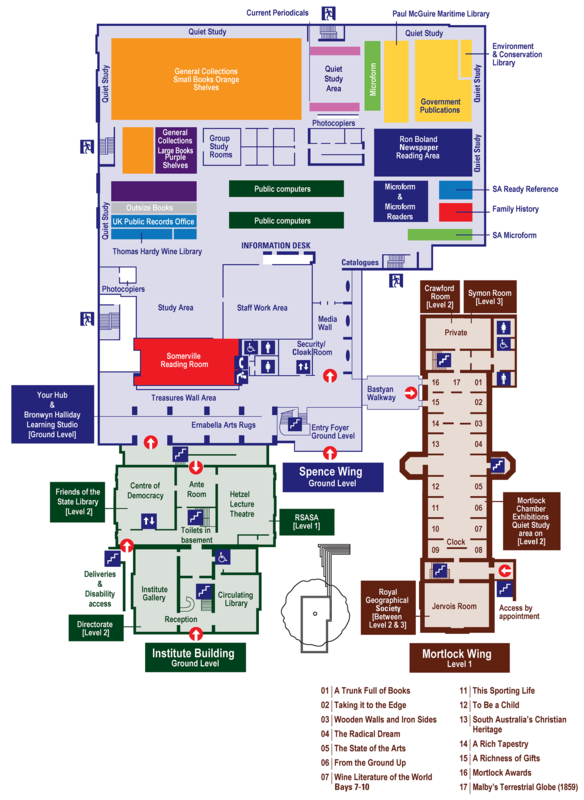 View the map and floor plan of the State Library, including the Spence Wing, the Institute Building, and the Mortlock Wing. How do I get to the State Library by public transport? The 'State Library, Art Gallery, Museum' tram-stop is just outside the State Library. There are bus stops close by near the War Memorial on North Terrace. The closest train station is the Adelaide city station on North Terrace. You can plan your journey via Adelaide Metro. Is there car parking near the State Library? The nearest car park is Wilson's Adelaide Central car park, 225 North Terrace, next to David Jones. There is paid metered street parking along Kintore Ave and Victoria Drive. Where is the wheelchair and stroller access? How do I check if the Mortlock Chamber is open when I plan to visit? The Mortlock Wing and Treasures Wall are venues for hire and subject to occasional closures due to functions and special events, please check our Open Hours for any venue closures on the day of your tour to avoid disappointment. Is there a cafe at the State Library? There is a cafe located in the back of the glass foyer at the State Library. View more information about the cafe and tenants.